FAMILY: Pradeep Meheta (Father), Ahuti Mishra (Mother), Bharat Meheta (Elder brother). ACADEMIC QUALIFICATION: Plus-Three final year arts student of Pataneswari Women`s College (Patnagarh). TYPE OF PLAYER: Opening batswoman and excellent gully/point fielder. RECEIVED COACHING FROM: Arun Nayak, Rituparna Roy, Ranjita Mohanty. PROFESSION: Joined Police Sub-inspector in Bhubaneswar UPD on April 30, 2015. WOMEN`S ODIs: Two matches, 2 innings, 0 not out, total 25 runs, highest 23, average 12.50, strike rate 39.06. WOMEN`S T20Is: Two matches, 2 innings, 0 not out, total 23 runs, highest 23, average 11.50, strike rate 62.16. Batting & fielding: 29 matches, 29 innings, 2 not outs, 559 runs, highest 50, average 27.70, one fifty, strike rage 73.35, catches 10. Batting & fielding: 52 matches, 51 innings, 5 not outs, 987 runs, highest 89, average 21.45, five fifties, strike rate 44.76, catches 19. Bowling: 18 balls, 0 maiden, 10 runs, 1 wicket, best bowling 1/4, average 10.00, strike rate 18.00, economy 3.33. 23: India vs Bangladesh, Women`s T20I at Cox`s Bazar, Bangladesh, March 11, 2014. 2: India vs West Indies, 2nd Women ODI at Basseterre, Mar 2, 2012. 23: India vs West Indies, 1st Women ODI at Basseterre, Feb 29, 2012. 0: India vs West Indies, 5th Women T20I at Basseterre, Feb 27, 2012. 30: Vs Jharkhand, BCCI Sr Women T20 League, Group-B Super League match, Sachin Tendulkar Gymkhana, Mumbai, 11 March, 2019. 14: Vs Himachal, BCCI Sr Women T20 League, Group-B Super League match, Sachin Tendulkar Gymkhana, Mumbai, 9 March, 2019. 4: Vs Assam, BCCI Sr Women T20 League, Group-B Super League match, Sachin Tendulkar Gymkhana, Mumbai, 8 March, 2019. 18: Vs Karnataka, BCCI Sr Women T20 League, Group-B Super League match, Sachin Tendulkar Gymkhana, Mumbai, 6 March, 2019. DNB: Vs Mizoram, BCCI Senior Women T20 League, Group-E match, CAP Siechem Ground, Puducherry, 1 March, 2019. 1: Vs Kerala, BCCI Senior Women T20 League, Group-E match, CAP Siechem Ground, Puducherry, 27 Feb, 2019. 69*: Vs Rajasthan, BCCI Senior Women T20 League, Group-E match, CAP Siechem Ground, Puducherry, 26 Feb, 2019. 51*: Vs Bengal, BCCI Senior Women T20 League, Group-E match, Palmyra Cricket Ground, Puducherry, 24 Feb, 2019. 23: Vs Madhya Pradesh, BCCI Senior Women T20 League, Group-E match, CAP Siechem Ground, Puducherry, 23 Feb, 2019. 28: Vs Pondicherry, BCCI Senior Women T20 League, Group-E match, CAP Siechem Ground, Puducherry, 21 Feb, 2019. 51*: Vs Saurashtra, BCCI Senior Women T20 League, Group-E match, CAP Siechem Ground, Puducherry, 20 Feb, 2019. 42: Vs Andhra, Sr Women One-day League, Quarterfinal, M Chinnaswamy Stadium, Bangalore, Dec 26, 2018. 1: Vs Jammu-Kashmir, Sr Women One-day League, Elite Group-C match, BOSE Ground, Cuttack, Dec 20, 2018. 32*: Vs Himachal, Sr Women One-day League, Elite Group-C match, Nimpur Ground, Cuttack, Dec 16, 2018. 4: Vs Rajasthan, Sr Women One-day League, Elite Group-C match, Sunshine Ground, Cuttack, Dec 14, 2018. 47: Vs Madhya Pradesh, Sr Women One-day League, Elite Group-C match, Nimpur Ground, Cuttack, Dec 10, 2018. 93: Vs Assam, Sr Women One-day League, Elite Group-C match, Sunshine Ground, Cuttack, Dec 6, 2018. 11: Vs Jharkhand, Sr Women One-day League, Elite Group-C match, Sunshine Ground, Cuttack, Dec 5, 2018. 14: Vs Uttar Pradesh, Sr Women One-day League, Elite Group-C match, BOSE Ground, Cuttack, Dec 3, 2018. 9: Vs Hyderabad, Sr Women One-day League, Elite Group-C match, Nimpur ground, Cuttack, Dec 1, 2018. 9: East Zone Vs Central Zone, Sr Women Inter-Zone 3-day match, Greenfield Stadium, Trivandrum, March 22-24, 2018. 15, 6: East Zone Vs North Zone, Sr Women Inter-Zone 3-day match, Greenfield Stadium, Trivandrum, March 18-20, 2018. 28: Vs Kerala, BCCI Senior Women T20 League, Plate final, Just Cricket, Bangalore, Jan 27, 2018. 14: Vs Karnataka, BCCI Senior Women T20 League, Plate semifinal, Alur Cricket Stadium, Alur, Jan 25, 2018. 37, 1: Vs Tamil Nadu, Senior Women T20 League, Plate Pool-C match, MA Chidambaram Stadium, Chennai, Jan 17, 2018. 14: Vs Chhattisgarh, Senior Women T20 League, Plate Group-C match, MA Chidambaram Stadium, Chennai, Jan 16, 2018. 32: Vs Tripura, Senior Women T20 Plate Group-C match, TI Murugappa Ground, Chennai, Jan 15, 2018. 40: Vs Jammu & Kashmir, Senior Women T20 Plate Group-C match, MA Chidambaram Stadium, Chennai, Jan 14, 2018. 17: Vs Punjab, Senior Women T20 Plate Group-C match, TI Murugappa Ground, Chennai, Jan 13, 2018. 10: Vs Haryana, Sr Women One-day League, Plate Group-A match, Ravenshaw University Ground, Cuttack, Dec 14, 2017. 1: Vs Tamil Nadu, Sr Women One-Day League, Plate Group-A match, Nimpur Ground, Cuttack, Dec 12, 2017. 32: Vs Karnataka, Sr Women One-Day League, Plate Group-A match, Ravenshaw University Ground, Cuttack, Dec 10, 2017. DNB: Vs Saurashtra, Sr Women One-Day League, Plate Group-A match, Nimpur Ground, Cuttack, Dec 8, 2017. 0: Vs Punjab, Sr Women One-Day League, Plate Group-A match, Ravenshaw University Ground, Cuttack, Dec 6, 2017. 22: Vs Hyderabad, Women`s Inter-State T20 match at Secunderabad, Feb 6, 2014. 40 n.o: Vs Haryana, Women`s Inter-State T20 match at Secunderabad, Feb 4, 2014. 25: Vs Railway, Women`s Inter-State T20 match at Secunderabad, Feb 3, 2014. 23: Vs Maharashtra, Women`s Inter-State T20 match at Secunderabad, Feb 2, 2014. 10: India-A Women vs SL Women, unofficial ODI at Vizianagaram, Jan 17, 2014. 31: India Red vs India Blue, Women`s Challenger Trophy final at Ranchi, Jan 10, 2014. 32: India Red vs India U-19, Women`s Challenger Trophy match at Ranchi, Jan 8, 2014. 4: India Red vs India Blue, Women`s Challenger Trophy match at Ranchi, Jan 7, 2014. 62: East Zone vs South Zone, Women`s Inter-Zone one-day match at Vadodara, Jan 3, 2014. 8: East Zone vs West Zone, Women`s Inter-Zone one-day match at Vadodara, Jan 1, 2014. 23: East Zone vs Central Zone, Women`s Inter-Zone one-day match at Vadodara, Dec 29, 2013. 27: East Zone vs North Zone, Women`s Inter-Zone one-day match at Vadodara, Dec 28, 2013. 4: Vs Bengal, Inter-State Women`s one-day match (Plate Group Final) at Perecherla, Dec 24, 2013. 9: Vs Rajasthan, Inter-State Women`s one-day match at Perecherla, Dec 22, 2013. 0: Vs Kerala, Inter-State Women`s one-day match at Perecherla, Dec 15, 2013. 64: Vs Andhra, Inter-State Women`s one-day match at Perecherla, Dec 13, 2013. 31 n.o: Vs Jharkhand, Inter-State Women`s one-day match at Perecherla, Dec 11, 2013. 89: Vs Baroda, Inter-State Women`s one-day match at Perecherla, Dec 9, 2013. 4: Vs Madhya Pradesh, Inter-State Women`s one-day match at Perecherla, Dec 7, 2013. 15: Vs Hyderabad, Women`s Inter-State T20 match at Pune, March 11, 2013. 13: Odisha Women vs Pak Women, World Cup warm-up ODI at Cuttack, Jan 29, 2013. * Appointed directly as Sub-Inspector of Police and received the appointment letter from the hands of Chief Minister Naveen Patnaik at Kalinga Stadium, Bhubaneswar on April 30, 2015. * Received the the 1st Saheed Sporting-Maruti Estate Woman Cricketer of the Year Award and a cheque of Rs 10,000 for the 2013-14 at Bhubaneswar on July 6, 2014. * Received the Saroj Mahasuara Memorial Award as the upcoming cricketer for the year 2012 in Bhubaneswar on Sept 6, 2012. * Selected among 30 probables for the ICC Women T20 World Cup 2012 in Sri Lanka. * Received a cash award of Rs 1 lakh on Feb 7, 2012 for being the first cricketer from Odisha to find a place in the Indian women`s team. 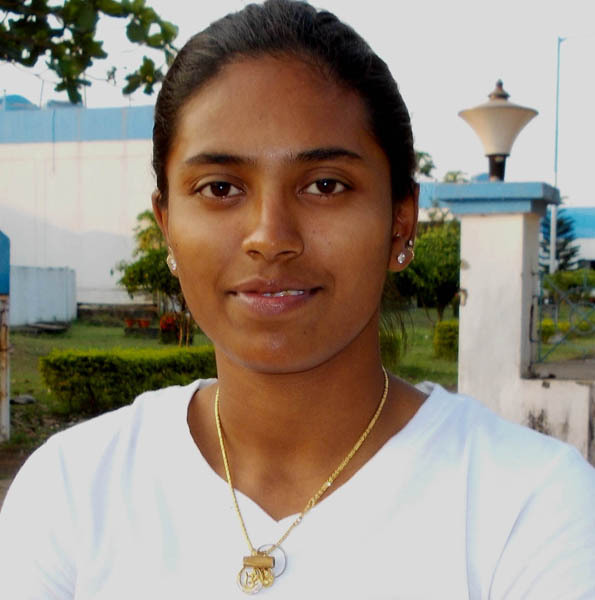 * On February 4, 2012 she became the first player from Odisha to find a berth in Indian women`s cricket team. * On January 14, 2012, she was selected 20 probables for India`s tour of the West Indies in February-March 2012. * Received coaching at zonal camp in Guwahati, Assam in 2011. * Receive coaching at National Cricket Academy in Bangalore in 2011. * Took to cricket in the year 2007, under the guidance of her father Pradeep Meheta and elder brother Bharat Meheta. * Her father was a good cricketer, who represented Bolangir district in the Kalahandi Cup inter-district tournament for several years.